Here’s the problem with high and rising pharmaceutical prices: It’s not just one problem, but many. Addressing them will require a range of solutions – many of them difficult to execute, and possibly tough medicine to swallow. These were key takeaways from the recent U.S. Department of Health and Human Services Pharmaceutical Forum,which I moderated. A broad group of stakeholders participated, including patients, consumer groups, pharmaceutical companies, pharmacy benefits managers, insurers and others. The key issues: Obtaining the greatest value for the dollars we spend on drugs –and having a vital biopharmaceutical sector that produces vaccines, effective treatments,and cures, at affordable costs for patients and the nation. Having slowed along with the rest of health care spending in recent years, pharmaceutical spending is now roaring ahead. Total pharmaceutical sales, now about $400 billion annually, are projected to reach as high as $590 billion in 2020, according to Doug Long, vice president of industry relations at IMS Health. New National Health Expenditure data show that national retail prescription drug spending grew 12.2 percent in 2014 – a sharp increase over 2.4 percent growth in 2013 — in large part due to increased spending for new drugs, such as cures for Hepatitis C.
There is, in fact, good news in much of this spending. For example, 96 percent of patients treated with the expensive new Hepatitis C drugs are cured in 8 to 12 weeks, and will not need extreme procedures like liver transplants down the line. And IMS estimates that the nation has saved an estimated $1.7 trillion over the past decade by switching from branded to generic drugs, which on the whole are priced lower in the United States than in most other countries. Old drugs with steep new prices. The last two years in particular have seen sharp price increases in many generic and branded drugs alike. Some, like the anti-infection agent Daraprim,went off patent decades ago; cost mere pennies to make; and are produced by a single manufacturer not subject to price competition – a force that has frequently produced downward price pressure in pharmaceuticals, as in other markets. Other drugs, like the multiple sclerosis drug Avonex, are nearing the end of their patent life, but prices have quadrupled or more over the past decade. Without any apparent explanation for why these prices should rise so steeply, the consensus is that manufacturers are hiking prices simply because they can. The consequences: Steep up-front deductibles and coinsurance in many health plans make many drugs costly, if not unaffordable, for patients. And with a bipartisan Senate panel now investigating some of these price hikes, polls show majorities of Americans across the political spectrum in favor of government action to lower drug prices. Solutions discussed at the forum included further action by the Food and Drug Administration to speed up approval of generic drugs. The Generic Drug User Fees Act (GDUFA), enacted in 2012, committed the FDA to take action on a backlog of nearly 3,000 generic drug applications within five years. Since then, FDA has overhauled its procedures, hired and trained more than 1,000 personnel, and agreed to exceed those GDUFA commitments, in part by prioritizing action on applications for new generic versions of drugs just coming off patent. FDA and industry are now discussing additional steps to improve the speed and predictability of reviews, including working jointly to improve initial applicationsso that they don’t bounce back and forth unnecessarily in the review process. Greater transparency also emerged as a key theme, especially since U.S. drug pricing overall is a dizzying crazy quilt. Outpatient drugs prescribed under Medicaid, or under the separate 340B program, have specific pricing structures under federal law. Separately, the Veterans’ Administration negotiates prices with manufacturers, but the Medicare program legally can’t. And although private insurers providing Medicare drug benefits do negotiate prices with manufacturers, and must disclose to CMS the discounts, or “rebates,” that they obtain, the government by law cannot make these discounts public. Yet compiling an official tabulation of all these prices paid for drugs would be one way to get a handle on the underlying reality. So would requiring more clarity from manufacturers about their actual expenditures for research and development, and their costs of production versus their profits on specific drugs. New drugs with steep new prices. A separate good news, bad news problem is the growing corps of specialty drugs, which now constitute 35 percent of pharmaceutical sales and whose prices overall have also been rising rapidly.Some, like the new hepatitis C drugs, constitute true cures; others, like targeted cancer therapies, are life-extending treatments, often for advanced cancers. Annual per-patient treatment costs for these cancer drugs, which may extend life for a matter of months, reached $100,000 a year in 2012. Manufacturers assert that prices are high because they must recoup huge outlays on research and development – especially since only a fraction of drugs developed in the lab will ever clear testing and regulatory approval and make it to market. But with other countries employing more regulatory pricing schemes, the U.S. is paying the highest prices anywhere for these therapies — and it’s often unclear what the relationship is between the price of a drug and its value in terms of efficacy or outcomes for patients. 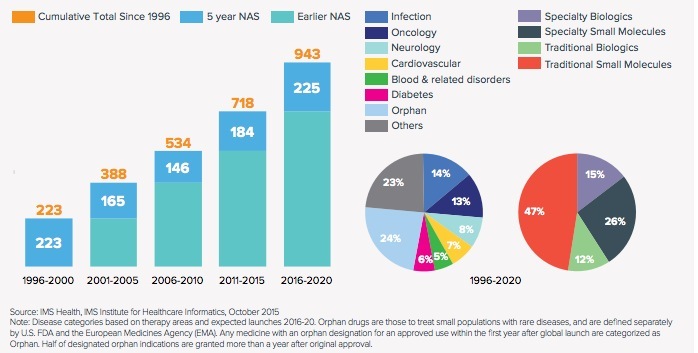 What’s more, a tsunami of such drugs is coming: IMS predicts 943 “new active substances” in 2020, most of which will be specialty drugs. There’s little doubt that patients want – and should have – access to many of these drugs. So how to make the costs affordable, and sustainable? One approach would be to make the drug development process more efficient– for example, through innovative clinical trial designs — so that more drugs make it through the testing and regulatory pipeline. And here again, the FDA approval process can play a role, since a key development that has led to lower prices for innovative hepatitis C drugs is simply the availability of competing products and resulting price competition. More commonplace overseas, there are now about two dozen of these pricing arrangements in place in the United States. One involves a complex contract between the pharmaceutical company Merck and the health insurer Cigna; it offers discounts on two Merck diabetes drugs if the patients Cigna covers are taking their medication and lowering their blood glucose levels. The point of such arrangements is to align incentives around “value” – better outcomes for patients. When those are achieved, Cigna gets lower prices and can pass savings along to its customers, while Merck sells more of its drugs. Pharmaceutical manufacturers, pharmacy benefit managers and insurers want to experiment with more of these arrangements, and see various regulatory obstacles removed. They want to see regulatory obstacles to them removed – including mandatory Medicaid discounts that could force them to extend any new price breaks they negotiated to every Medicaid program in the country. Yet speakers at the forum voiced varying opinions on the extent to which value-based contracts could be replicated throughout the industry. Executing these arrangements is administratively complex, and the resulting costs could eat up savings. And with the tidal wave of new drugs coming, it is difficult to imagine all can be covered under a variety of value-based contracts with different payers. What options remain? Consumer representatives at the forum voiced a strong preference for allowing the Secretary of Health and Human Services to negotiate Medicare prices for drugs with manufacturers.But no new ideas were advanced about how to get around a major potential problem with that approach. Here’s the problem: Drug price discounts are typically achieved by restricting access to more costly drugs and throwing the business to the manufacturer that offers the best-priced effective treatment for a given condition.Without that authority to institute a single drug formulary for all of Medicare, the Congressional Budget Office has concluded, the government would lack negotiating leverage and the savings would be negligible. To be sure, there’s debate over this issue. Yet it’s hard to imagine how the political fallout could be overcome if the government curbed access to some drugs across the board, or frequently picked one pharmaceutical company as the “winner” over another. In the end, even the solution that garnered the most widespread support at the forum could prove difficult to achieve: recycling “no-value” spending in health care into higher-value spending on drugs. “The enemy for all of us is waste in the health care system,” said Steve Miller, chief medical officer of the pharmaceutical benefit manager Express Scripts. At least some of that waste is linked directly to current pharmaceutical use, and shows up as medication errors, patients’ lack of adherence to treatment, or inappropriate use of many drugs, including antibiotics. Doug Long pointed to IMS estimates that $213 billion annually could be saved in these areas – money that arguably could then be spent on appropriate uses of truly innovative medications. Continuing to tackle much or all of this would be a tall order. But it’s undoubtedly urgent if the nation is to preserve a viable pharmaceutical sector, and a health care system, that is affordable and accessible for all. Susan Dentzer is the Senior Policy Adviser to the Robert Wood Johnson Foundation. The analysis presented is her own, and not that of the foundation. I think transparency helps here. A .Gov approach that highlights and publicizes market irregularities and price increases could be very helpful. Public outrage is a powerful thing in our society, as Martin Shkreli has discovered ..